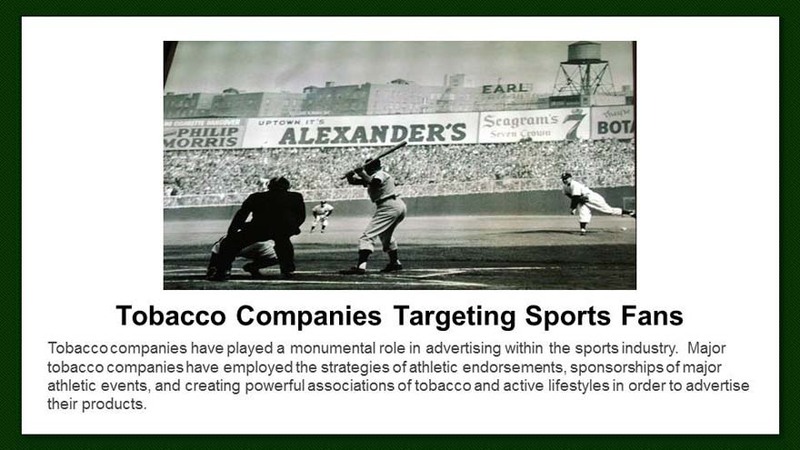 Tobacco companies have played a monumental role in advertising within the sports industry. 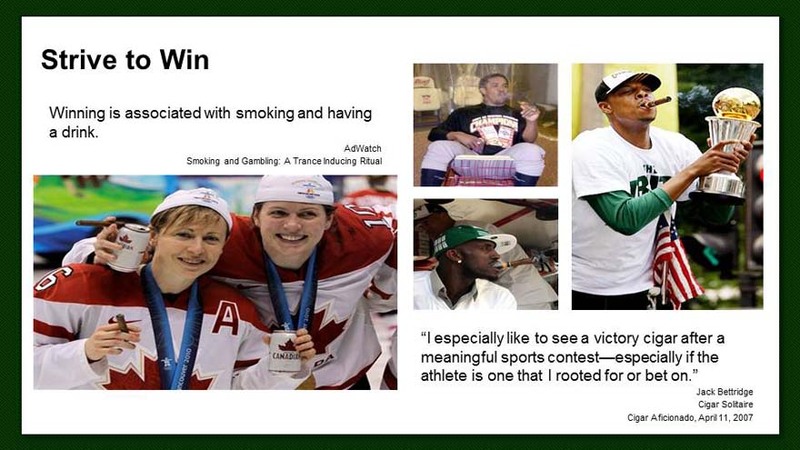 Major tobacco companies have employed the strategies of athletic endorsements, sponsorships of major athletic events, and creating powerful associations of tobacco and active lifestyles in order to advertise their products. 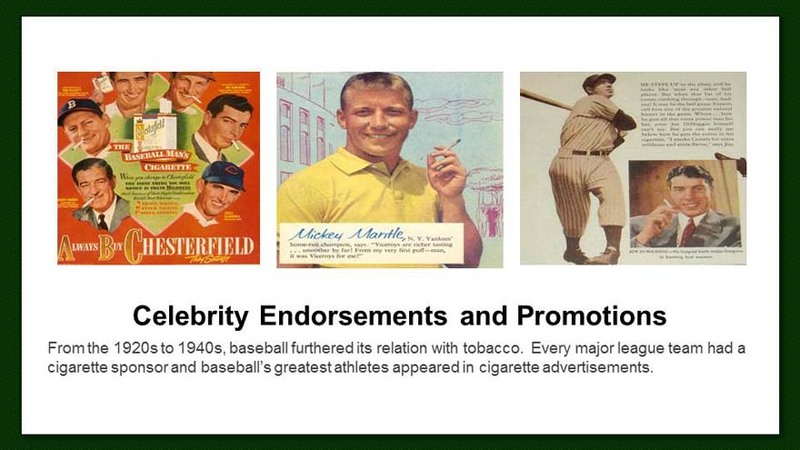 From the 1920s to 1940s, baseball furthered its relation with tobacco. Every major league team had a cigarette sponsor and baseball’s greatest athletes appeared in cigarette advertisements. 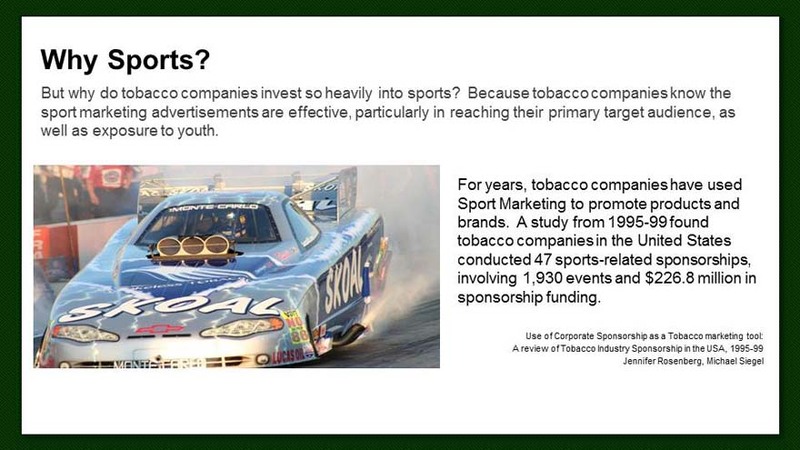 But why do tobacco companies invest so heavily into sports? 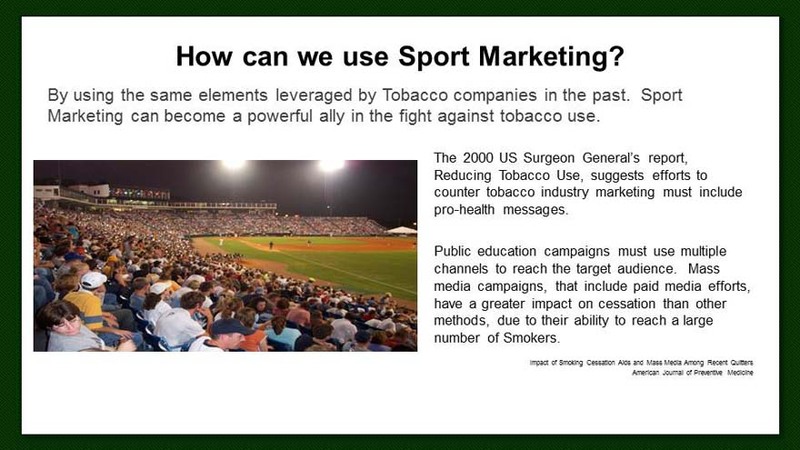 Because tobacco companies know the sport marketing advertisements are effective, particularly in reaching their primary target audience, as well as exposure to youth. 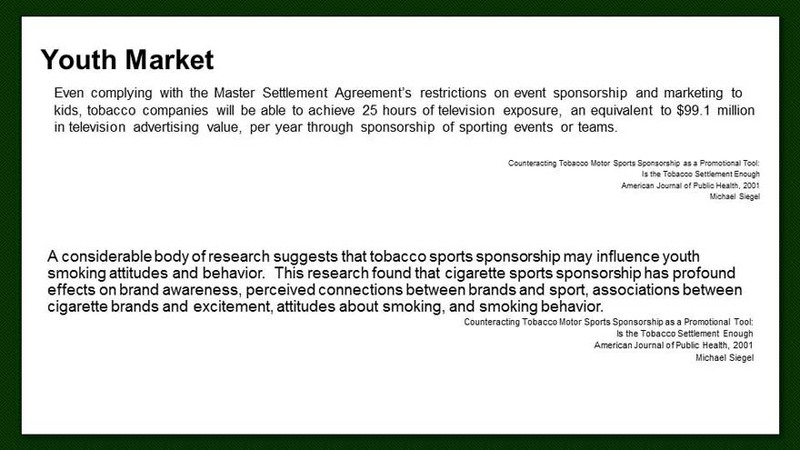 Even complying with the Master Settlement Agreement’s restrictions on event sponsorship and marketing to kids, tobacco companies will be able to achieve 25 hours of television exposure, an equivalent to $99.1 million in television advertising value, per year through sponsorship of sporting events or teams. 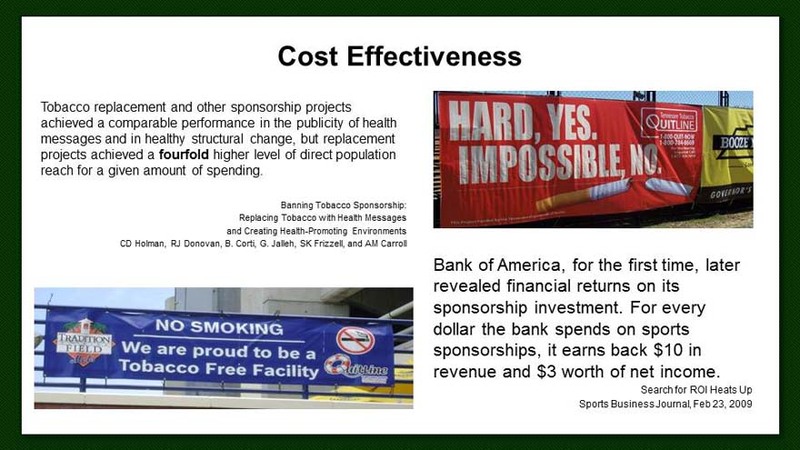 A considerable body of research suggests that tobacco sports sponsorship may influence youth smoking attitudes and behavior. This research found that cigarette sports sponsorship has profound effects on brand awareness, perceived connections between brands and sport, associations between cigarette brands and excitement, attitudes about smoking, and smoking behavior. 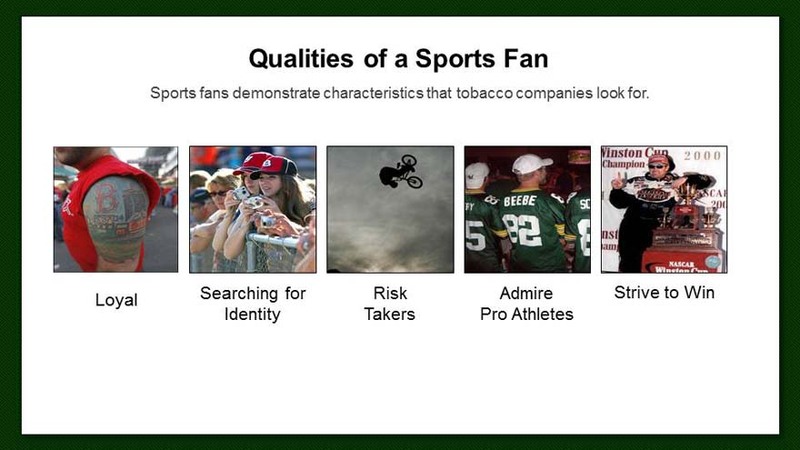 Sports fans demonstrate characteristics that tobacco companies look for. 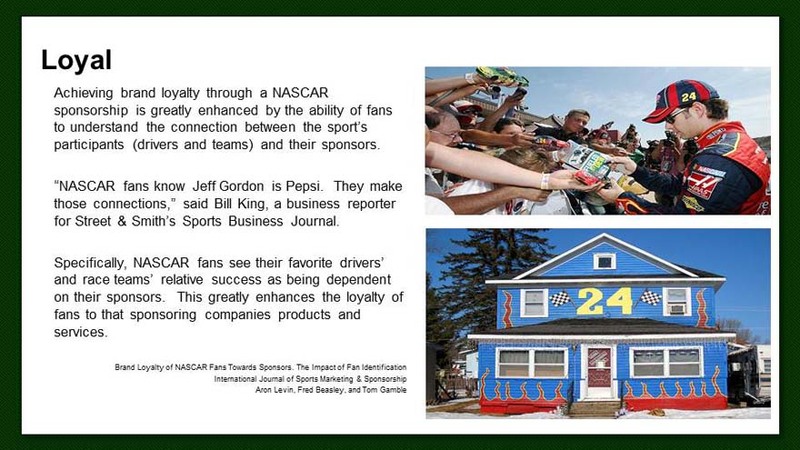 Achieving brand loyalty through a NASCAR sponsorship is greatly enhanced by the ability of fans to understand the connection between the sport’s participants (drivers and teams) and their sponsors. “NASCAR fans know Jeff Gordon is Pepsi. 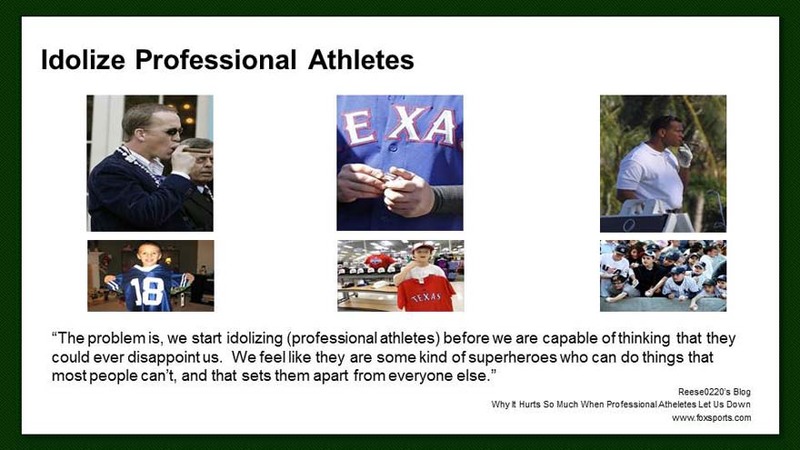 They make those connections,” said Bill King, a business reporter for Street & Smith’s Sports Business Journal. 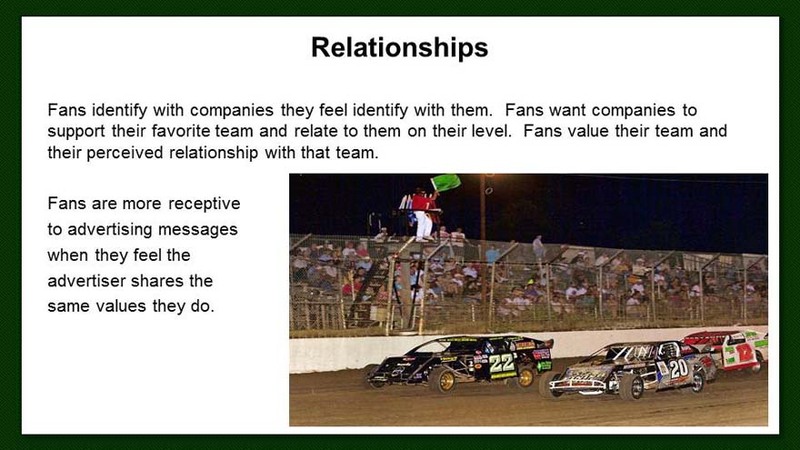 Specifically, NASCAR fans see their favorite drivers’ and race teams’ relative success as being dependent on their sponsors. This greatly enhances the loyalty of fans to that sponsoring companies products and services. Sports fans are constantly searching for social identity; whether it’s their favorite sports team or the brand of cigarettes they smoke. Categorization: We often put others and ourselves into categories. 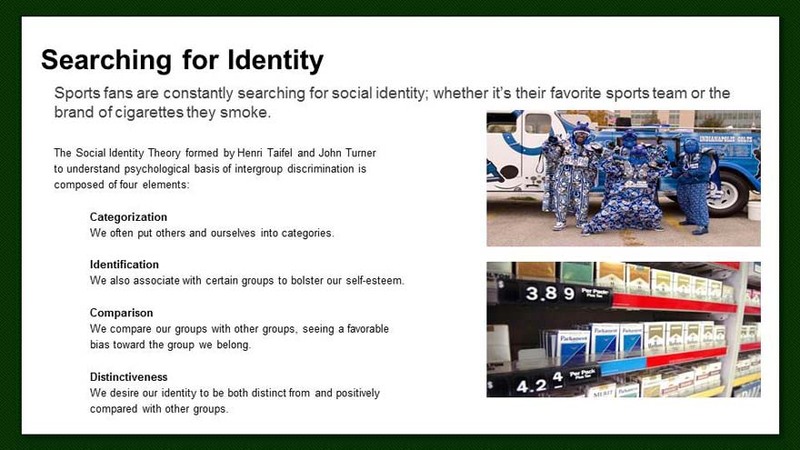 Identification: We also associate with certain groups to bolster our self-esteem. Comparison: We compare our groups with other groups, seeing a favorable bias toward the group we belong. 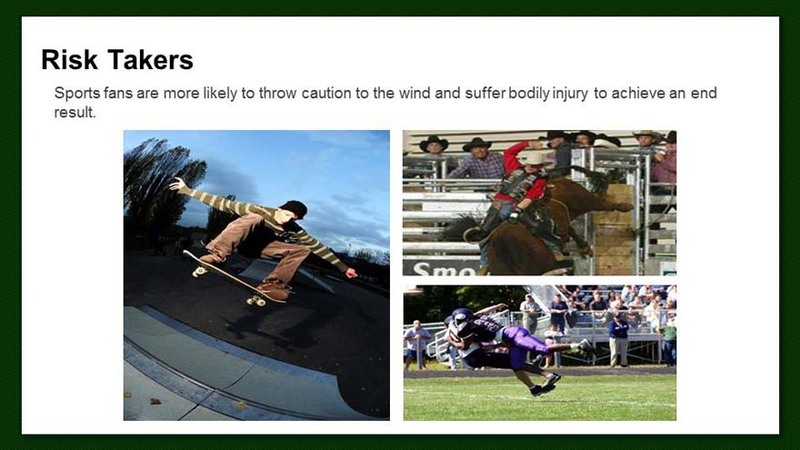 Sports fans are more likely to throw caution to the wind and suffer bodily injury to achieve an end result. "Winning is associated with smoking and having a drink." 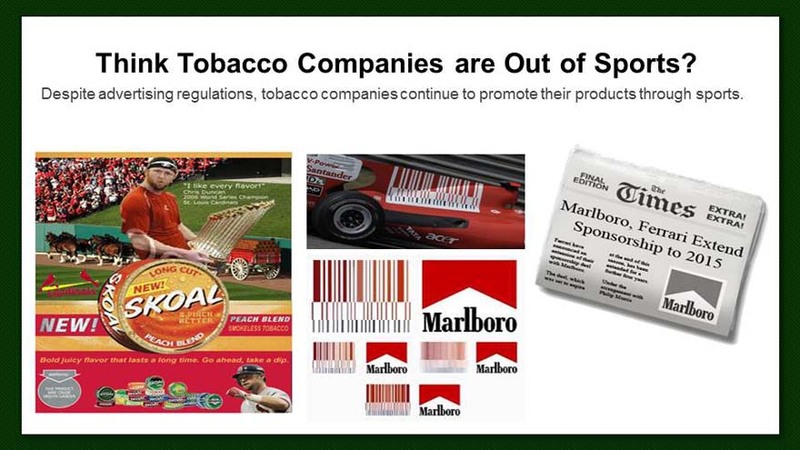 Despite advertising regulations, tobacco companies continue to promote their products through sports. By using the same elements leveraged by Tobacco companies in the past. 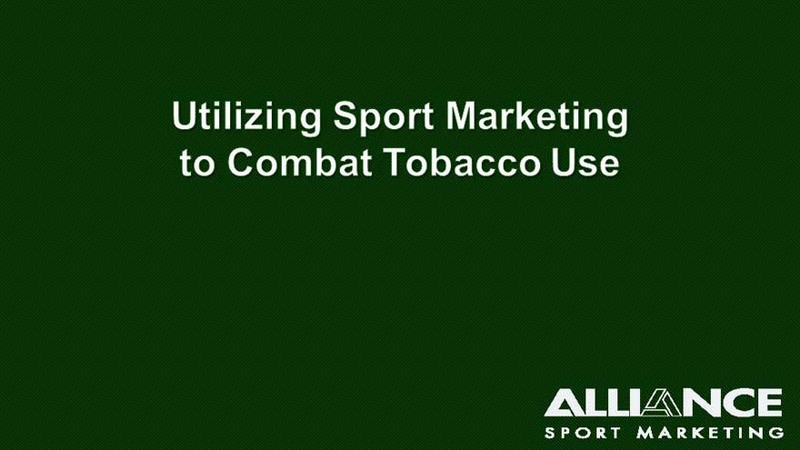 Sport Marketing can become a powerful ally in the fight against tobacco use. The 2000 US Surgeon General’s report, Reducing Tobacco Use, suggests efforts to counter tobacco industry marketing must include pro-health messages. Public education campaigns must use multiple channels to reach the target audience. Mass media campaigns, that include paid media efforts, have a greater impact on cessation than other methods, due to their ability to reach a large number of Smokers. 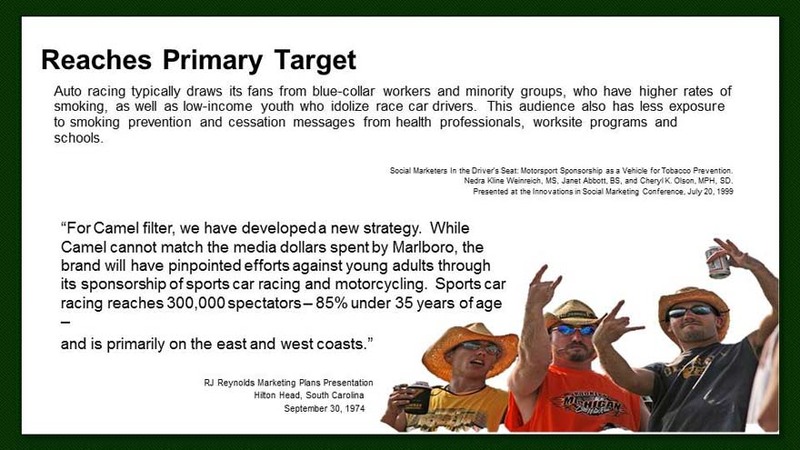 NASCAR fans are 28% more likely to smoke than other adults. 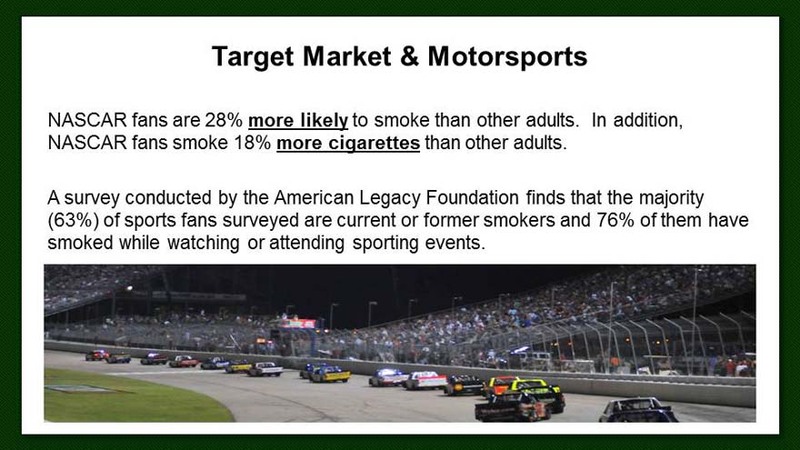 In addition, NASCAR fans smoke 18% more cigarettes than other adults. A survey conducted by the American Legacy Foundation finds that the majority (63%) of sports fans surveyed are current or former smokers and 76% of them have smoked while watching or attending sporting events. 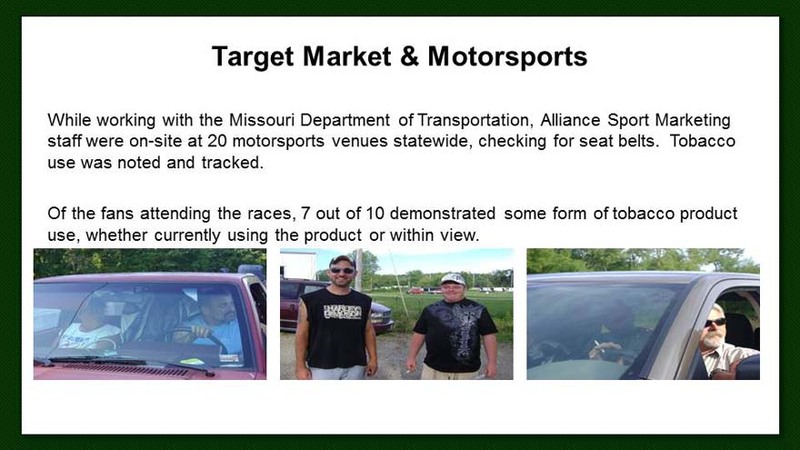 While working with the Missouri Department of Transportation, Alliance Sport Marketing staff were on-site at 20 motorsports venues statewide, checking for seat belts. Tobacco use was noted and tracked. 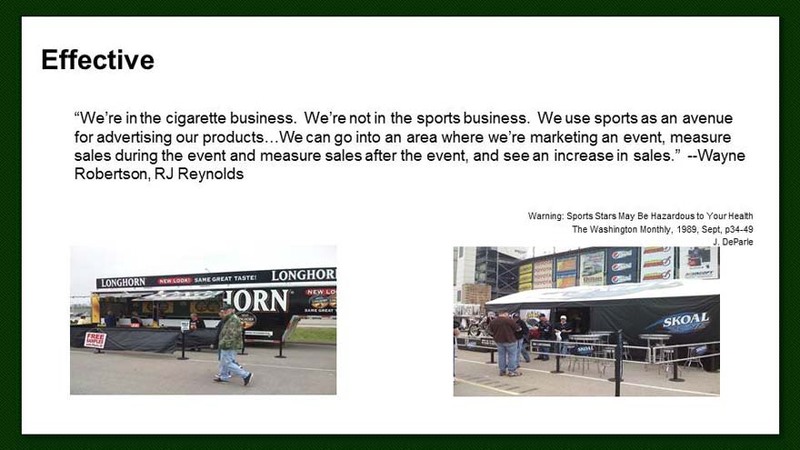 Of the fans attending the races, 7 out of 10 demonstrated some form of tobacco product use, whether currently using the product or within view. Tobacco replacement and other sponsorship projects achieved a comparable performance in the publicity of health messages and in healthy structural change, but replacement projects achieved a fourfold higher level of direct population reach for a given amount of spending. An important aspect of sponsorship is the level of loyalty many enthusiasts pledge to sponsors of their favorite athletes, teams or sports. When many social marketing issues require an emotional – not just rational – response from someone to adopt a behavior, the benefit of having the target audience positively disposed to the message because of a desire to support a sponsor is unmistakable. 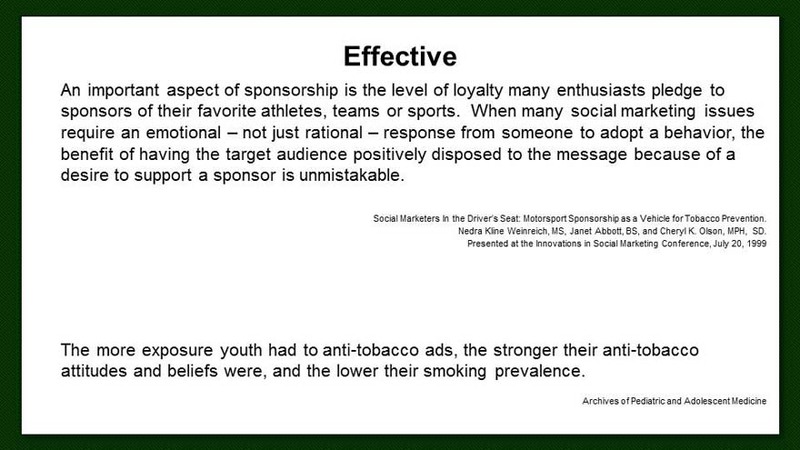 Social Marketers In the Driver’s Seat: Motorsport Sponsorship as a Vehicle for Tobacco Prevention. Nedra Kline Weinreich, MS, Janet Abbott, BS, and Cheryl K. Olson, MPH, SD. 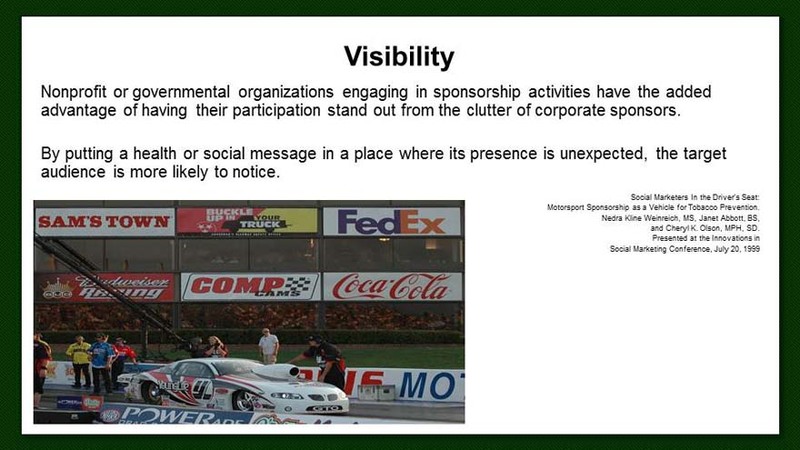 Nonprofit or governmental organizations engaging in sponsorship activities have the added advantage of having their participation stand out from the clutter of corporate sponsors. By putting a health or social message in a place where its presence is unexpected, the target audience is more likely to notice. Motorsport Sponsorship as a Vehicle for Tobacco Prevention. Fans identify with companies they feel identify with them. 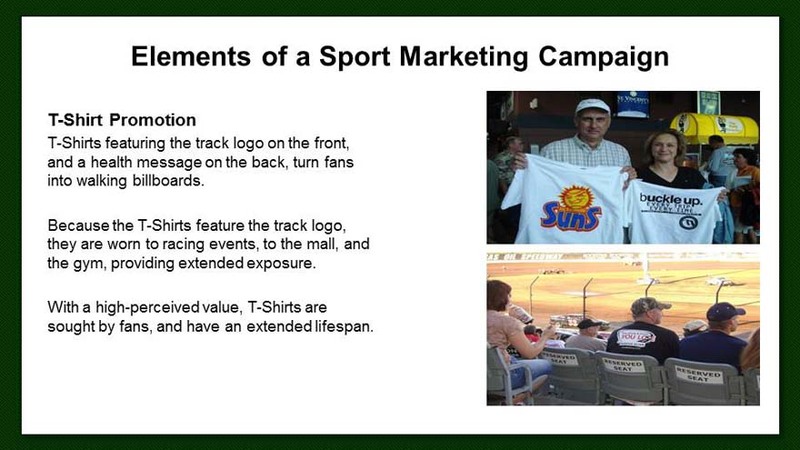 Fans want companies to support their favorite team and relate to them on their level. Fans value their team and their perceived relationship with that team. Fans are more receptive to advertising messages when they feel the advertiser shares the same values they do. 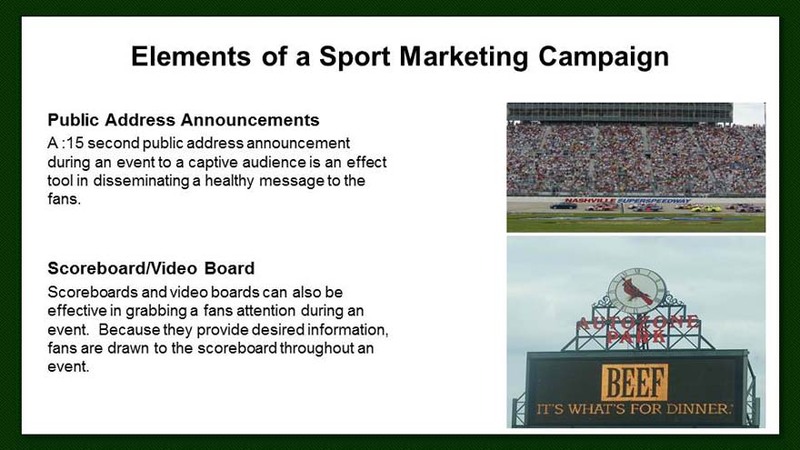 Sport Marketing provides consistent, extended exposure throughout an event, to a captive audience. 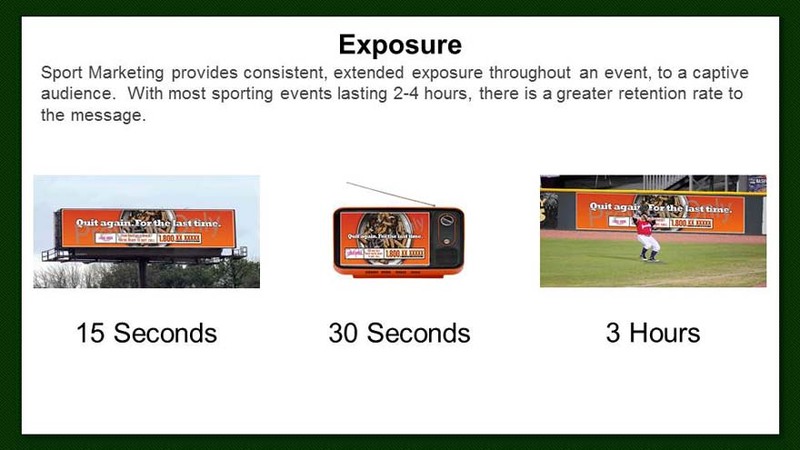 With most sporting events lasting 2-4 hours, there is a greater retention rate to the message. 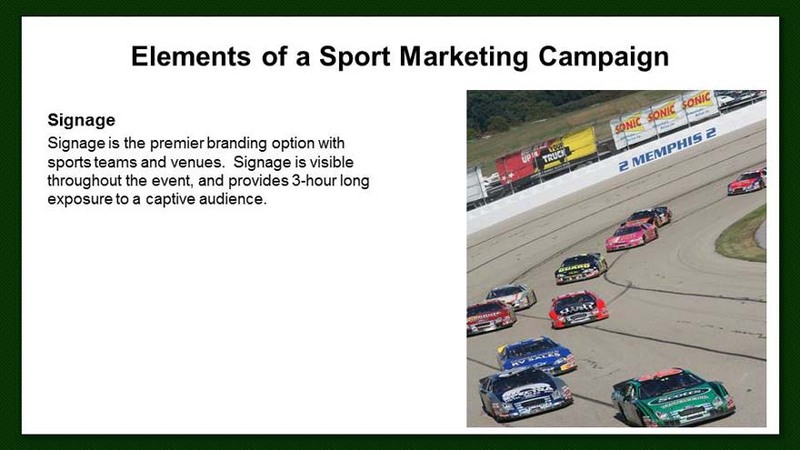 Sport Marketing, particularly minor league sports and motorsports venues, reach communities typical advertising can miss. 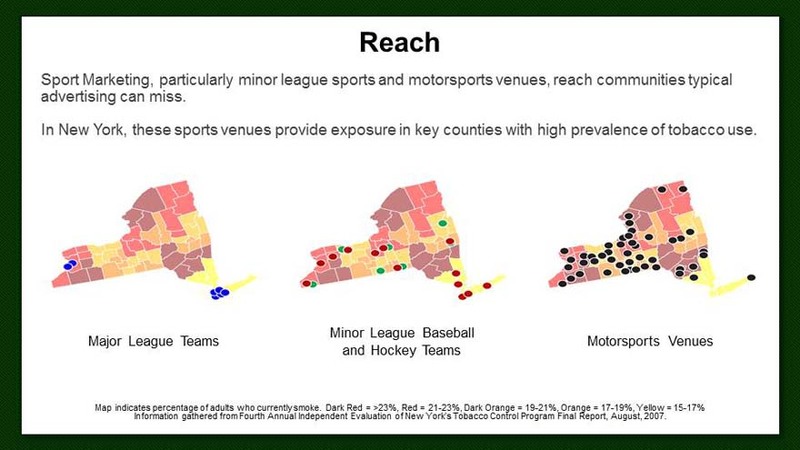 In New York, these sports venues provide exposure in key counties with high prevalence of tobacco use. Signage is the premier branding option with sports teams and venues. Signage is visible throughout the event, and provides 3-hour long exposure to a captive audience. T-Shirts featuring the track logo on the front, and a health message on the back, turn fans into walking billboards. Because the T-Shirts feature the track logo, they are worn to racing events, to the mall, and the gym, providing extended exposure. With a high-perceived value, T-Shirts are sought by fans, and have an extended lifespan. Souvenir programs provide information to fans in attendance, and serve as a souvenir from the event. 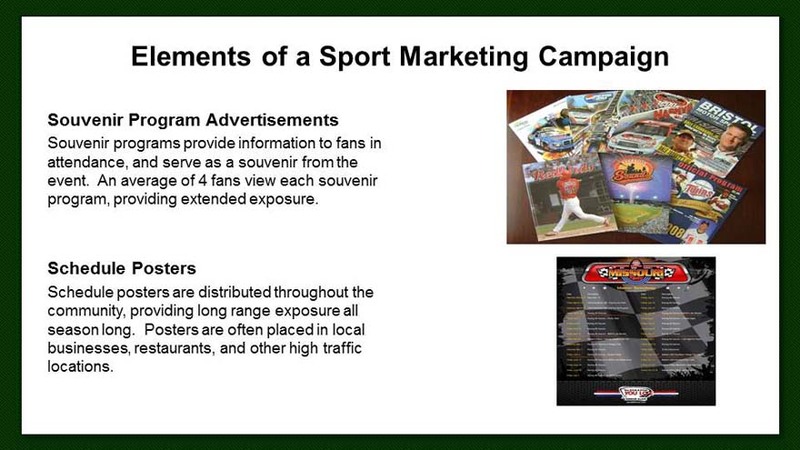 An average of 4 fans view each souvenir program, providing extended exposure. Schedule posters are distributed throughout the community, providing long range exposure all season long. Posters are often placed in local businesses, restaurants, and other high traffic locations. A :15 second public address announcement during an event to a captive audience is an effect tool in disseminating a healthy message to the fans. Scoreboards and video boards can also be effective in grabbing a fans attention during an event. Because they provide desired information, fans are drawn to the scoreboard throughout an event.